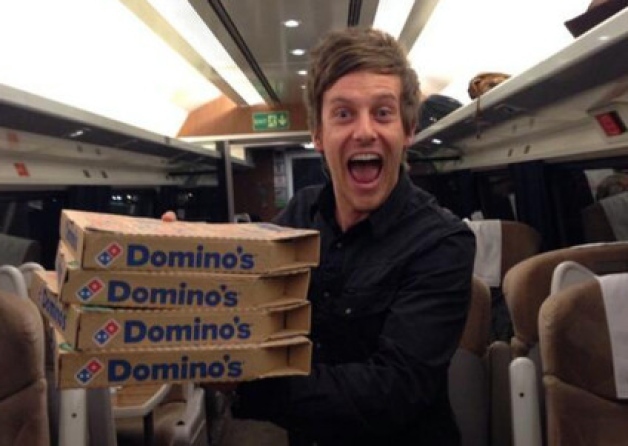 Tyneside comedian Chris Ramsey took to Twitter to encourage @Dominos_UK to arrange for pizza to be delivered to him as he took a train from London to Newcastle, with the hashtag #PizzaOnATrain trending worldwide. After getting his 290,000 followers involved, including a few famous faces, the team at Dominos Doncaster took on the challenge, dropping off pepperoni pizza for Ramsey – and his fellow passengers – free of charge as the train pulled into the station. A photo of Ramsey clutching pizza boxes in the train aisle was retweeted over 8,000 times, with the comedian suggesting that, next time around, he would raise the stakes to #ChickenOnAJetski.